Want to volunteer this holiday season? Don't. We're entering the "Season of Giving." But don't don an apron and make a beeline for your local soup kitchen. Not now. 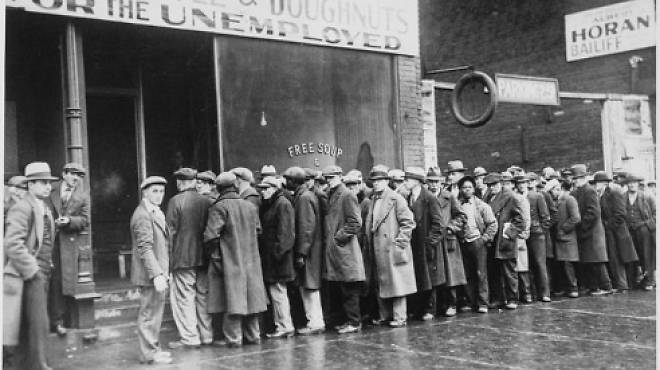 Unemployed men queued outside a soup kitchen opened in Chicago by Al Capone in 1931. The holiday spirit is about even the coldest hearts melting, Ebenezer Scrooge–style, and hearts growing three sizes, the Grinch–style, and lending a hand to those in need, like how Ernest bails Santa out of jail in Ernest Saves Christmas. It's in the spirit of that spirit that we've run stories in the past about holiday volunteering opportunities. Readers routinely ask where and how to pitch in on Thanksgiving and through the end of the year, and we've pointed them in the direction of food pantries, shelters, crisis intervention centers and more. But recently, when we circled back around to some of these organizations and asked what they currently need, volunteer–wise, one thing became clear: not much. "We're inundated," said a representative at Rogers Park's A Just Harvest, the highest capacity community kitchen in the metropolitan Chicago area. "Our needs aren't confined to Thanksgiving. The fact is, people need to eat 365 days per year." A call to Interfaith House in Garfield Park, a facility that helps ill and injured homeless adults regain their health, led me to this voice message: "If you are calling to volunteer for Thanksgiving Day, please know that we are totally filled up. We cannot take one more volunteer. But thank you for your concern." A few weeks ago, Kathy Morris, director of Ignatian Services, which operates a food pantry on the North Side, told me she's overwhelmed with volunteering inquiries during November and December. People get in touch about helping serve the Thanksgiving dinner or distributing holiday food baskets. "Don't get me wrong, we love the interest," Morris explained. "But we provide services throughout the year." Volunteer requests for holiday meals at Deborah's Place, Chicago’s largest provider of supportive housing for women, are on a first-come, first-served basis. The agency advises interested parties to ask about availabiliy for these meals—Thanksgiving and Christmas Eve/Day—as early as August. The solution? Don't binge on volunteering at the end of the year like you do on Christmas cookies and the Chicago Mix from Garrett's. If there's an organization or service group you're interested in helping, schedule a time in the new year to submit a volunteer application and/or go through the orientation process. Ask the volunteer coordinator what times of year extra help is needed, then make a commitment to volunteer during those times. More effective still, volunteer all year. The gift of time, given consistently, is arguably far more valuable than one afternoon of ladling mashed potates onto plates. Not everyone can make a regular commitment—say, every week or month—but sites such as VolunteerMatch.org, which match your experience and interests to nonprofits in need, offer single-day, short-term and flexible opportunities. If you want to help now—i.e., "But giving to the less fortunate is a holiday tradition! "—consider contributing money, food, books, clothing or other resources to nonprofits in need. "We can always use things like pancake mix and syrup and spices," Morris said. Remember, though, a delivery of nutrient-rich foods to your local food bank in the middle of summer, which no one dubs the "Season of Giving," is likely to have greater impact. If we all extended, or more thoughtfully timed, our charitable impulses, we could make Christmas happen in July.